A supportive team atmosphere will encourage you to develop your competitive swimming skills. Refine your freestyle, backstroke, breaststroke, and butterfly while developing your racing starts, turns, finishes, and strategies. Regular competition with other area clubs occurs throughout the summer. The season culminates with the Western Racquet Club Swimming Championships. Older age groups will involve more sustained conditioning. Swim team members must have either previously passed or must be currently enrolled in Polliwog (formerly level 3) swim lessons. Team members must attend at least half of the practices to participate in championship meets. If a competition occurs Monday through Thursday, regular practice for that day will be cancelled. Join the Western Racquet Club diving tradition and develop your competitive diving techniques from a basic approach to a challenging stunt. Practice in WRC's deep well, on the 1 meter and 3 meter boards. Ready yourself for the numerous diving meets throughout the season as well as the diving showcase during the August Awards Banquet. Team members must attend at least half of the practices to participate in championship meets. If a competition occurs Monday through Thursday, regular practice for that day will be cancelled. Become a Western Racquet Club Sharkette! Develop numerous synchronized swimming figures that you will execute at practice, in competition, and during the Western Racquet Club Synchronized Swimming Show in August. 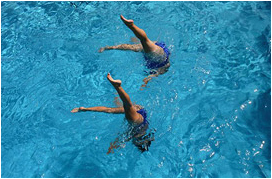 We recommend that synchronized swimmers have either previously passed or are currently enrolled in Guppy swim lessons. If a competition occurs Monday through Thursday, regular practice for that day will be cancelled. Enroll in our Western Racquet Club swim lessons and become familiar with both safety skills and swimming strokes. Our lessons will teach basic floats and locomotion strategies to the beginning swimmer and instill swimming proficiency in resting strokes (elementary backstroke, sidestroke, overarm sidestroke, inverted breaststroke, and trudgen crawl) as well as power strokes (butterfly, backstroke, breaststroke, and freestyle) to the advanced swimmer. 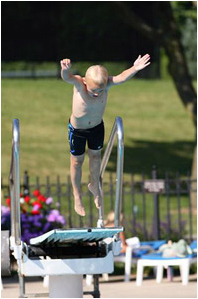 Basic water safety principles are included in swim lessons at all levels. As usual, Western Racquet Club swim lessons maintain the smallest ratio of students to instructors of area group swim lesson programs. Our staggered sections of Eel and Pike (formerly levels 1 and 2) decrease that ratio for our youngest swimmers. Wondering what level swimming lessons to sign up for? In this level your child will learn about water exploration in the shallow end of the pool with two instructors present at all times. Throughout the course of the lessons, we will begin with assisted safe water entry into the pool, beginning with putting different parts of the body and face into the water, progressing to a full bob, and eventually working on assisted jumping into the pool and assisted front-paddle. This level furthers your child's aquatic exploration with two instructors by continuing to develop your child's front-crawl at a more independent level. Throughout the course of the lessons, we will teach various water skills such as independent water entry and exit skills, independent jumping, submerging and surfacing skills, refining a front-crawl style, and eventually taking a few jumps off the low diving board. This level will help your child learn techniques and skills that will further refine their swimming skills. Throughout the course of the lessons we will teach front-crawl skills, elementary backstroke, over arm backstroke, complete independent jumping skills with surface recovery, and safe jumping off the low diving board. This level will expand your child's range of swimming stokes. Throughout the course of the lessons, we will teach a variety of techniques to help swimmers learn the butterfly, breaststroke, and sidestroke. Guppy is an introduction to these more difficult strokes, as Fish will refine them. Also taught in the later weeks of this level is diving off the side of the pool, blocks, and diving board. Is able to swim one length (long way) of front crawl, over arm backstroke, and elementary backstroke. This level will start to perfect your child's strokes as well as his/her knowledge about swimming. Throughout the course of the lessons, we will teach swimming in a more traditional form by having the swimmers do more laps to build their endurance. At this stage, the instructors help swimmers refine their strokes and work on a more competitive outlook in swimming. Is able to swim at least 2 lengths (long way) of advanced front crawl, backstroke, breaststroke, elementary backstroke, and sidestroke. This is the final level that is offered. Throughout the course of the lessons we will teach very advanced and competitive skills and swimmers will be able to swim multiple laps of each stoke. Advanced competitive "race-diving" will be taught as well as flip turns and other advanced transitions. Is able to swim at least 3 lengths and demonstrate advanced knowledge of each: front crawl, backstroke, breaststroke, elementary backstroke, sidestroke, and butterfly. *If you are unsure of your child's swimming abilities we would be happy to assess your child on the first day of lessons so we can find the appropriate level. In addition, we can look up any records we have from the previous summer. Also, private lessons are available if you want to give your child a head start or refresh their memory so they are ready for the first day of lessons.